The US Naval Institute reports that during an unclassified exercise as part of RIMPAC USS Dewey (DDG-105) fired 20 hyper velocity projectiles (HVP). The rounds were fired from a 5″/62 Mk45 Mod4. In choosing the Mk110 57mm because it was seen as a better AAW weapon, a better anti-swarm weapon, as lighter, cheaper, easier to maintain or man, for whatever reason, the Coast Guard will have a weapon that is at best only marginally more capable, perhaps even less capable, of performing the most likely missions–stopping/sinking a surface target or performing NSFS–than the weapons of 60 to 90 years ago. While the size, toughness, and survivability of merchant ships has increased dramatically, the Coast Guard has not provided its ships with a significantly improved capability to stop or sink a ship since the introduction of the 5″/51 in 1921. I still think the Coast Guard should add a light weight anti-surface vessel torpedo to its inventory as the cheapest way to have a truly effective ship stopper that can be made widely available. But until such a weapon becomes available, the Mk45 5″ is the best alternative available. The 5″ Mk45 is a versatile weapon. Equipping the OPCs with this weapon make the ships more capable of performing both the PWCS and probable wartime mission and significantly enhances the NSFS capability of US Naval forces in a major conflict. I think the argument for the 5″ just got a lot stronger. The test involved shooting guided rounds at a target of cruise missile size and speed. That has got to mean extreme accuracy against even moving targets. Adding this capability to Cutters would increase both their survivability and their offensive capability. 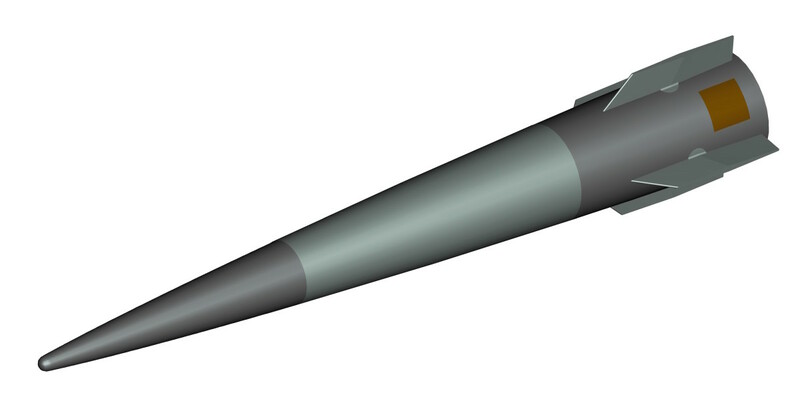 In addition it would substantially increase their capability to forcibly stop a vessel of almost any size since the projectiles, about seven times heavier than an 57mm round, would be traveling at near hypersonic speeds, they would likely disable any engine it hits by kinetic energy alone. I have not seen any particular kind of guidance identified for this test. The illustration above does appear to show a panel, presumably one of four, between the fins at the base of the projectile. The projectiles apparently weigh about 45 pounds, and may cost as little as $25,000, far less than even the relatively cheap RAM short range anti-air missile at about $1M each. Range is expected to be about 40 miles when fired from a 5″ gun. The Mk45 Mod4 was first installed on the USS Winston Churchill (DDG-81) commissioned in 2001, superseding the earlier 5″/54 Mk45 mods. Since then it has been the standard USN 5″ gun. It is also in service with the Australian, South Korean, Japanese, and Danish Navies, and they will arm the British Type 26 frigate. Earlier models of the 5″ Mk45 also serve in the Navies of New Zealand, Greece, Spain, Turkey and Thailand. The gun mount is not a lot larger than the 5″/38 Mk30 mounts that were used on over 50 Coast Guard cutters (255s, 311s, 327s, 378s, and icebreakers) between the early 1940s and their removal from the 378s in the late ’80s and early 90s. In fact the early models of the Mk45 were designed as a drop in replacement for the 5″/38. Earlier 5″/38 mounts used by the Coast Guard were highly manpower intensive requiring 14 to 15 to fully man the mount and pass projectiles and powder. Full manning for a Mk45 Mod4 is only six, a Gun Captain, Panel Operator and four ammunition Ioperators, all below deck. It can fire up to twenty rounds before the four ammunition operators arrive on station, allowing relatively easy Condition III manning. The 5″/38 mount weighed about 41,000 pounds. The Mk45 Mod4 is estimated to weigh 50,456 lbs. (22,886 kg) without a lower hoist and 54,398 lbs. (24,674 kg) with a four-flight lower hoist. that is at most a 33% increase. What the Soviets used to call the correlation of forces is changing. The Navy’s top surface warfare officer told a gathering at the Surface Navy Association Seminar, For the ship crews, “we need to have them prepared on a moment’s notice to turn the readiness we are building into lethality,” that they had to be ready to fight now. It is not too early to start thinking about a “B class” OPC. Replace the 57mm with the 5″/62 Mk45 mod4, replace the 25mm Mk38 with SeaRAM. Add the sensors from the LCS ASW mission module at the stern. Add some Anti-Ship Cruise Missiles Forward. Make sure we have space to support MH-60R ASW helos it is supposed to be able to hangar with torpedoes and sonobuoys. That is not a whole lot different from the systems we had on the FRAM 378s, and the OPC is a third again as large. 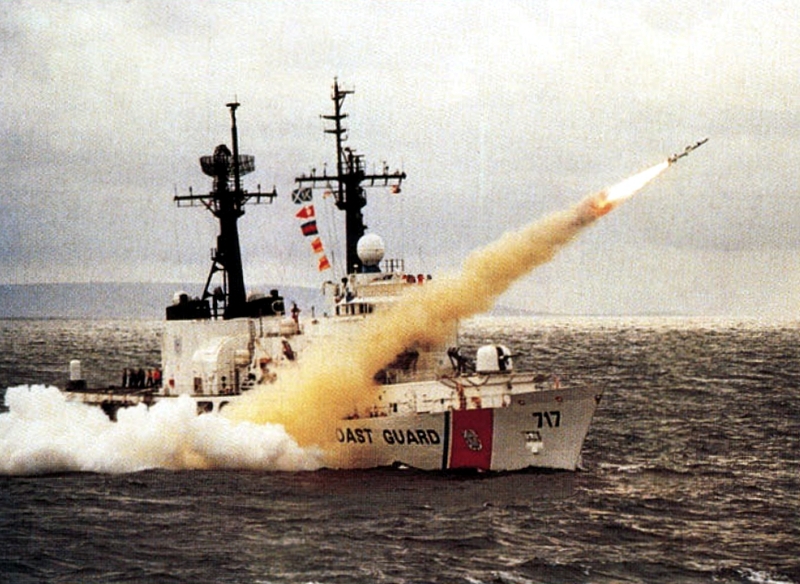 USCGC Mellon seen here launching a Harpoon anti-ship cruise missile in 1990. This entry was posted in AAW, Anti-Submarine Warfare, ASuW, ASW, Offshore Patrol Cutter, OPC, Weapons by Chuck Hill. Bookmark the permalink. The principal limitation atleast in the form currently being tested is the projectile weight. A standard 5″ round is about 70lbs. Because of the sabot used to accommodate the fins the projectile weight is down to 28lbs and he payload, presumably guidance and explosive charge is down to 15lbs. As usual in engineering nothing for nothing. Could also be passive IR, laser, or RF from the SPG-9. Could also be command guidance to intercept. From what I have been reading several types of ammunition are being prototyped. I would certainly like to know about this particular test. How fast and how large was the target? Did it maneuver? How many rounds per kill? How far out were the kills? 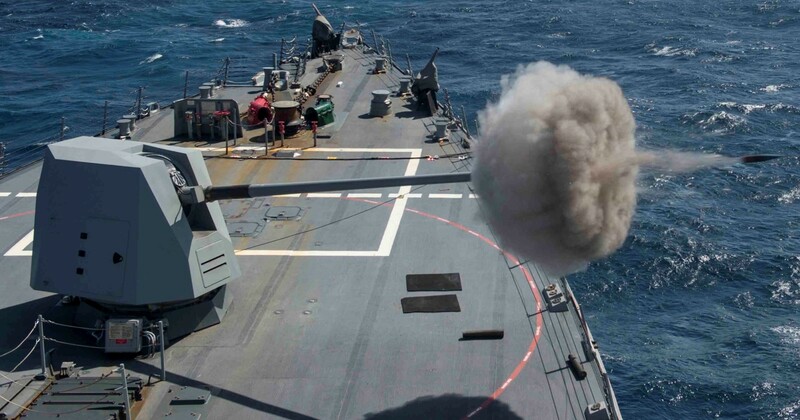 Lots of unanswered questions right now, but very encouraging that it appears the Navy is now committed to providing guided hypervelocity rounds for the gun. I did not that the destroyer that conducted the test was unique in having a laser weapon installed which made me think maybe it played a role in the test. Passive IR would be difficult to accomplish in the Gs a projectile gets shot at, while keeping it small, and being advanced enough to discriminate between tailpipe and other parts of the target (or background/decoys). RF from the SPG-9 is a good possibility, but for small, fast targets with hypervelocity projo.? Probably another high liklihood, as at close (gun) range, it’s do-able, but other alternatives are better. Could also be illumination from the Mk 99/SPG-62 as well, if it’s SARH guidance. Just like any old-fashioned SM-2 or ESSM. I’ve been looking for the proposed HVP guidance solution for anti-missile work but haven’t found anything. Anyone have any links discussing this? Chuck, where’d you see that the HVP test was against an actual missile surrogate? All I’ve been able to find is that “20 or so rounds were fired”, not at what, or that any guidance at all was involved. BSmitty, Maybe I was reading more into it than there was but there is repeated reference to bot guidance and use against cruise missiles. I read those as what they “want to do” with HVP, rather than what it can do, currently. Since this is still a DARPA project, this first test may’ve just been solid, ballistic rounds through the automatic loading system. My guess is it’d have to proceed to a program of record to warrant combat system integration and real guidance development. What they which is very similar to the NSC and OPC have, would be sufficient for the HVP round also. Is Alamo related to HVP? I’ve never seen that connection. In one of these things I saw it mentioned that ALaMO was derived from work on the HVP, sorry, can’t pinpoint where I saw it. Can’t really find much out about ALaMO’s guidance other than vague references to an “active seeker”. The nose of the round doesn’t look like it’s shaped for IR guidance, so it must be radar. Since the LCS doesn’t have illuminators, it’s probably active radar guidance. That would be fairly impressive on such a small munition. ALaMO has an easier job than HVP. It only has to deal with relatively slow small boats. HVP is meant to shoot down supersonic, maneuvering missiles. It would make sense to use active radar guidance on HVP too, but I imagine it has much higher seeker performance requirements. OPC “B class” is a good idea. The more you try to up-gun it, the more opponents will object. I would go with the newer and in-service Leonardo Super Rapid 76mm gun. Which would mean shorter development time and cost, more rounds onboard and in magazines, and smaller handling systems. LCS ASW mission module at the stern sound doable, but then the boats would need to be in davits. Remember to account for additional aviation spaces and air det for the Romeo. Which BTW also has ASM so it could be used for long range shooting as well as sub hunting. The OPC’s boats are already in davits. No stern ramp. Problem with the 76 mm is that it is not a standard USN system now and USN pays for CG weapons. I’d like the OPC “B class” to be ice-hardened. I’m ok with the 57mm for what it’s worth, but remote 25mm guns is the way to go, plus either a SeaRAM/21-cell RAM or Phalanx CIWS above the hangar. Plus s/w for NSMs.